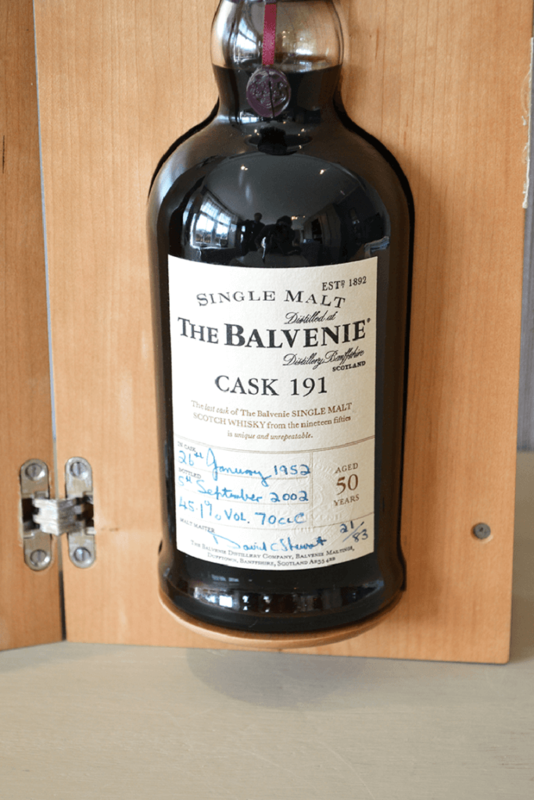 As you have probably read by now, I got an opportunity recently to taste The Balvenie’s Cask 191 with David Stewart, the Balvenie team, and some fellow social media personalities. The bottle was supplied by Instagram’s @thescotchfather and the tasting event at Jack Rose Dining Saloon in Washington DC was organized by the Balvenie. Thanks again for making this happen! To read about the rest of the experience that evening, please check out my full tasting event recap. This review is just about Cask 191. 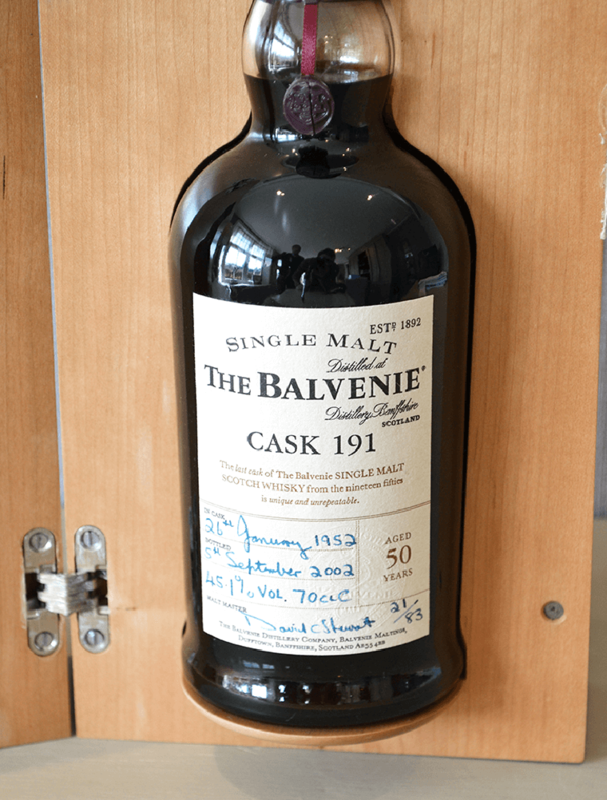 Cask 191 was a big deal when it was initially released. I mean a REALLY big deal. The press release for this bottle conveyed a tone of rarity and innovation on the part of The Balvenie and for good reason. Cask 191 is the smallest ever release at 83 bottles. I did some quick math before getting the official numbers and my angel’s share estimate of 75% evaporation was still too low. The actual number was 77%, the equivalent of 173 bottles. This whisky was also the very first Balvenie release to be solely matured in a sherry cask. David Stewart said at the tasting event that they couldn’t be 100% sure of that fact but the press release info gives an indication that they were probably 95% sure. My tasting notes scream “sherry” as well so I’m willing to put that uncertainty to rest. The natural cask strength of 45.1% after 50 years is pretty impressive given that the in-cask strength was 63.5%. It’s a wonder it stayed above 40% at all! The suggested retail price of this bottle at release time is the other number that really blew me away. It was selling for £6,000 in 2002. Mind you, this was during a time when you could get 30 year old single malts for $100. The whisky world was nothing like it is today. We see bottles selling regularly these days for hundreds of thousands of dollars and barely bat an eye anymore. In 2002, this was earth-shattering. We each got a ½ oz pour in a crystal cut Glencairn that featured David Stewart’s signature and the words “Cask 191” on it. These were made in Scotland and flown over specifically for this event. The only person in the room to have tasted Cask 191 before was David Stewart and that was in 2002 when it was being bottled. Needless to say, it was a big moment for all of us. Cask 191 was distilled in 1952 and bottled in 2002 making it 50 years old. There were only 83 bottles made. Rare? Yup. Expensive? Let’s just say that at today’s secondary market prices, this cost significantly more than my car. Nose Pure PX sherry. I know this smell well because a few weeks earlier, I had some amazing 20 year old PX. The similarities were astounding. With this comes incredible sweetness in the form of rock candy and caramel. There was also heavy baking spice and every single dried fruit you could think of. Yup, even that one. Taste Before this, I had only tasted old single cask Balvenie (i.e, over 40 years) once before. This is now the second time that a super old Balvenie has taken on a completely new level of candy sweetness that I’ve never experienced in any other whisky. I wish I could describe it further but I simply can’t put it into words. The huge sherry influence was also very apparent here. Cherry cough drop, molasses, brown sugar, cappuccino, and dark chocolate rounded out the palate here. There was less fruit than on the nose aside from the red berries that normally go with a sherrybomb. Finish This finish was incredibly drying and right off the bat was the “old oak” note you can only get from a whisky that’s over 30 years old. More baking spice follows as well as sherry. Did I mention how drying this is? Licorice and cacao nibs rounded out a finish that was just right in length. Overall Thoughts I’ve tried very old and very rare whisky before. In fact, I’ve been lucky enough to try a surprising amount of stuff 50 years or older (Lucky me). Is this the best whisky I’ve ever had? No. It is something I could drink every day? I doubt it due to the pure decadence and sweetness. Was it a unique whisky? Absolutely. But what really made tasting Cask 191 so great was the experience as much as it was the whisky. I was in the company of 24 other people that truly understood and appreciated what we opened and tasted that evening including the man responsible for bottling it 15 years earlier. Total Score I don’t do this often because I love data, but I can’t fairly score this in any meaningful way without completely destroying my rating scale in one way or another. This whisky shall remain scoreless.